← Did a “Novichok” programme ever exist? UPDATE (April 9 2018) — In the days following the publication of this post, a MIT professor (Theodore A. Postol), several renown journalists (Robert Parry, Hersh Seymour), many former members of the US IC (Including ex-CIA Ray McGovern), former diplomats and even Colonel Wilkerson (Former Chief of staff of General Colin Powell) went public to denounce the official narrative of the Kahn Shaykhun attack. One year later… On Saturday (April 7 2018), dozens of people were reported to have been killed in a chemical attack in Douma, Eastern Ghouta region. One video — recorded by a suspicious organization known as the White Helmets — shows men, women and children lying lifeless inside a house. Both Syria and Russia deny a chemical attack took place. On Monday (April 9 2018), several missiles struck the Tiyas airbase, near the city of Homs. The exact number of victims has not yet been reported. Israel allegedly conducted the strike. At the time of the attack the town was under the control of Tahrir al-Sham, formerly known as the al-Nusra Front. “Syrian aircraft ‘knew’ there was a weapons cache in this particular rebel-held area. That was correct, and the Syrian aircraft bombed it. Where is CIA Director Mike Pompeo? As President Trump was launching his missile strike against Syria, CIA Director Pompeo and other intelligence officials were nowhere in sight. 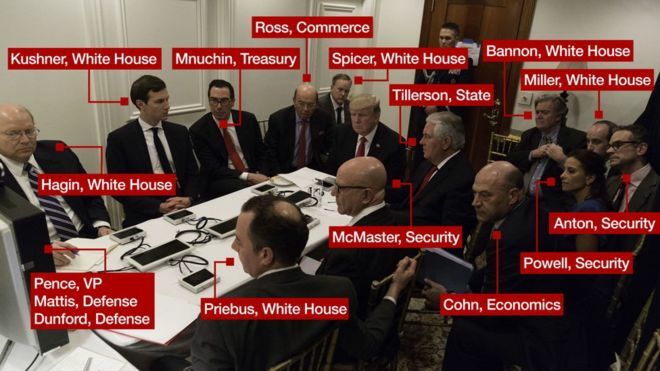 Back row from left: Deputy chief of staff Joe Hagin, senior adviser Jared Kushner, Treasury Secretary Steven Mnuchin, Commerce Secretary Wilbur Ross, Sean Spicer, President Trump, Secretary of State Rex Tillerson, chief strategist Steve Bannon, senior adviser Stephen Miller, national security official Michael Anton. Front from left: Chief of staff Reince Priebus, national security adviser HR McMaster, chief economic adviser Gary Cohn, deputy national security adviser Dina Powell. According to Spicer’s tweet, the people present are looking at a screen showing Vice-President Mike Pence, Defence Secretary James Mattis and Joseph Dunford, chair of the Joint Chiefs of Staff. RELATED POST: CIA Director Mike Pompeo — Who Is Who in World Intelligence and Security Agencies? 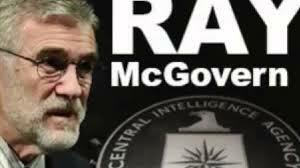 Ray McGovern served as a CIA analyst from the administration of John Kennedy to that of George H.W. Bush, and prepared the President’s Daily Brief for Nixon, Ford, and Reagan. He is a member of the Steering Group of Veteran Intelligence Professionals for Sanity (VIPS). This entry was posted in CIA, Mike Pompeo, Ray McGovern, Syria, Trump and tagged Boris Johnson, CIA, Consortium News, Idlib, Khan Shaykhun, Mike Pompeo, President Bashar al-Assad, Ray McGovern, Robert Parry, Syria, Syria 'Chemical Attack' 2017. Bookmark the permalink.